Jack Black at his best! Great soundtrack! I LOVE THIS MOVIE!! I've watched it so many times I could buy it like 5 times!! Amazing movie to watch. It should make anyone who watches it feel good. 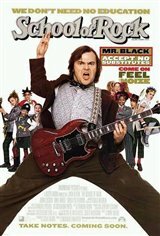 I really liked School Of Rock. Maybe I`m stupid because it`s mild humour for Jack Black. But I found it funny, and the music was pretty good too. it is one of the best comedies i have ever seen!!!!! Fantastic. Over the top hilarious!! !